National Novel Writing Month: Welcome! Check out some real published Nano novels! Nanowrimo: What is "Come Write In"? Learn more by contacting us below! 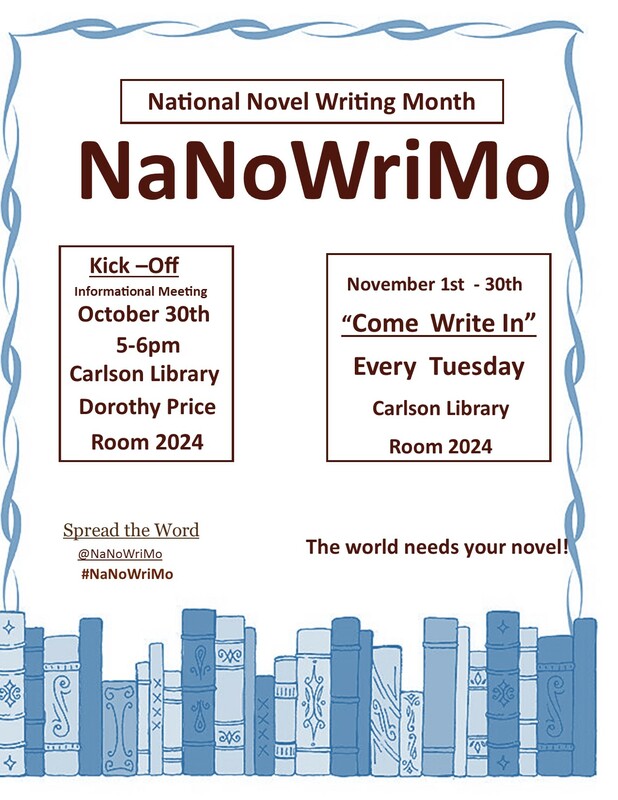 Sign up for Nanowrimo's Kick-off session, our "Come Write In" sessions and our special guest author's workshop! October → sign up below! Learn everything you need to know by attending our free Kickoff (informational) session! November - National Novel Writing Month! "Come Write In"
"NaNoWriMo gives me the opportunity to put into words what goes on in my head without having to worry about sounding completely ridiculous. It's a judgment-free zone for all writers." -- Josephine. Once I made the scary commitment of attending the initial meeting, I had the attitude of “I am going to do this, somehow.” Do not go in with the attitude “I’m going to try to do this.” If you do, you will have already given yourself permission to quit. It’s really hard, no doubt, but it is exciting, fun, and very self-gratifying. All the encouragement Nanowrimo provides is priceless! That wonderful word count kept me going on a daily basis. I would encourage anyone who is “thinking about it” to just “do it.” Just keep writing! You will not regret it at 11:59 p.m. on November 30th, I promise!"